This time it was that there had been another mass shooting, this time at a nightclub in Orlando. 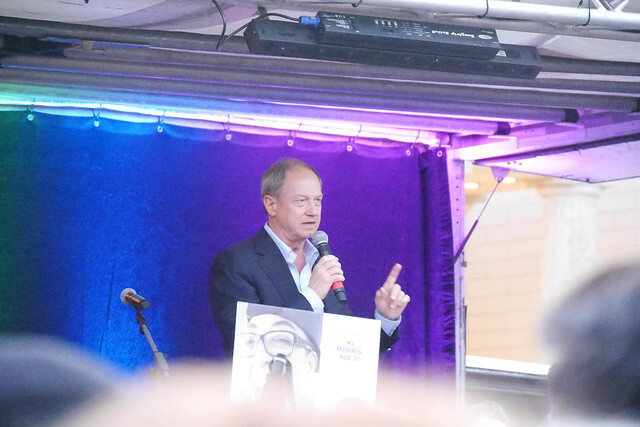 That was it – that was the bit of news I heard – and yet, in the pit of my stomach, I instinctively knew that it was going to have been at a gay bar. That feeling was the exact same feeling I had when I first heard that a student had been pistol-whipped, tied to a fence, and left for dead. The summary was pretty awful – and yet, in the pit of my stomach, I instinctively knew that the student was going to have been a gay student. And so it is: Matthew Shepard in 1998; Orlando in 2016. 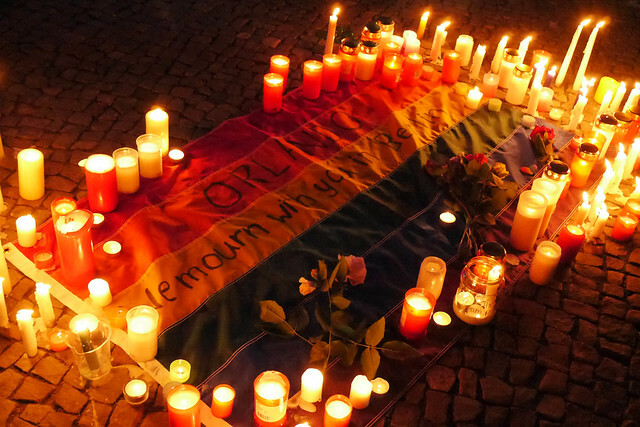 These are, of course, two events in the long, seemingly endless, history of gay bashing – there is an endless supply of horrific events that demonstrate the strange, innate, hatred that many people have of gays, lesbians, bisexuals, transgendered, questioning, and intersexed individuals. Or even of individuals perceived, rightly or not, to be of these communities. 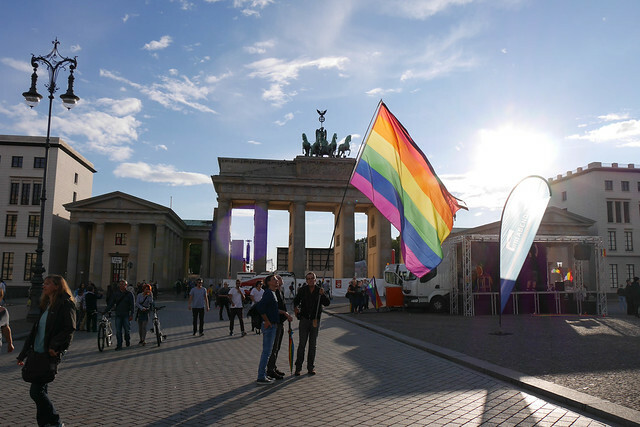 The display before the US Embassy in Pariserplatz. The vibe of the two events could not have been more different: Monday was a media circus: 60% media, 20% politicians and other semi-important people, 20% people like me who were wondering if the media could be any more obnoxious and intrusive. I, and the friend I went with, left without feeling the cathartic sense that we felt was desperately needed. Saturday, on the other hand, was amazing: I have no idea how many people were attending, but according to the Facebook count, 6,100 people said that they would attend. Pariserplatz was packed – from where I was standing, there was nothing but a huge mass of people. I have no idea how many people can fit into Pariserplatz, but surely all 6,100 who said that they would come, plus another few thousand, were there. 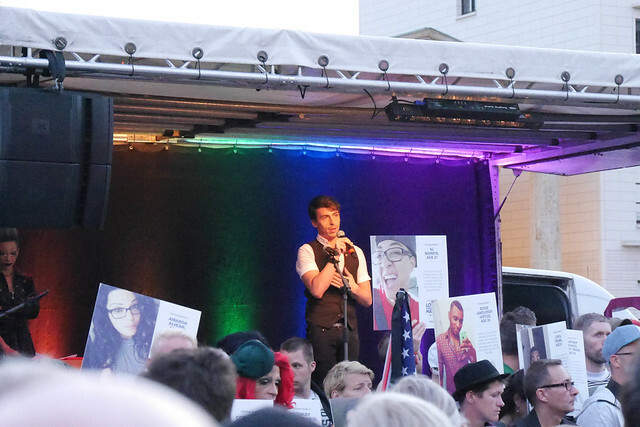 Well before the crowd arrived, there was a lot of Pride. 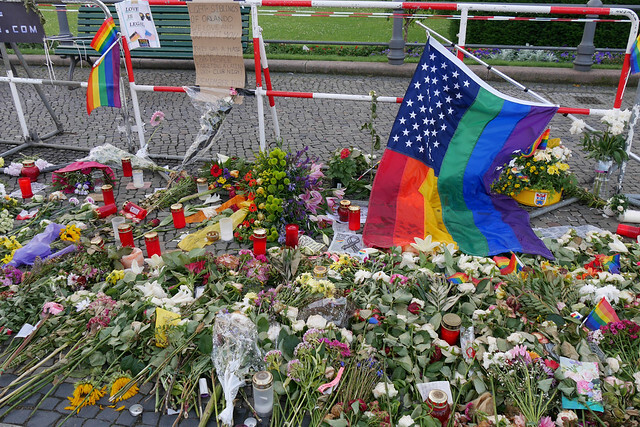 The tone of Berlin for Orlando was cathartic, at least for me: some singing, Mr. 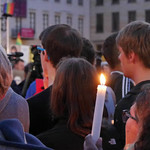 Gay Florida, the US Ambassador, reading the names of the 49 victims, and candles. Mr. Gay Flordia – who had worked at Pulse. US Ambassador John B. Emerson speaking about Hope and Love winning. 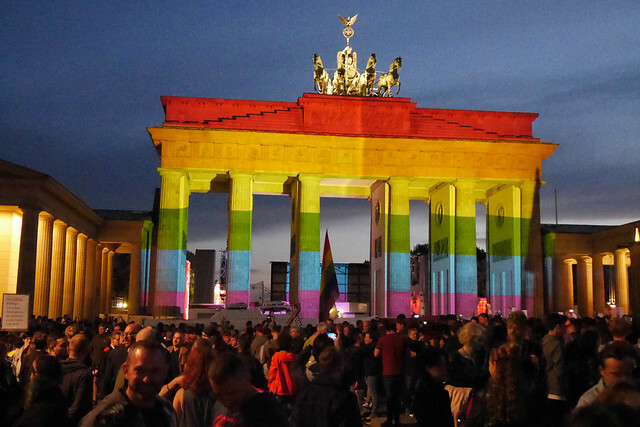 And Brandenburger Tor, in rainbow colors.